A labor of love for Dr. James E. Shepard, North Carolina Central University grew from a small religious training school to a college in the UNC system largely due to his perseverance in the 1910s-1930s. It continued to grow over the mid-to-late 20th century into the university it is today. The establishment of what would become North Carolina Central University can accurately be described as the product of the dedication of James E. Shepard, who embarked upon seemingly sisyphean effort, in the early years, to establish the school. Shepard's labor of love was born out of the Baptist religious tradition; Shepard had moved to Durham from Raleigh with his father, Augustus Shepard, who became minister of the White Rock Baptist Church in 1901. James Shepard was born in 1875, and had graduated from Shaw University with a degree in Pharmacy by the time his father moved to Durham. Shepard was among many Shaw (and Leonard Medical School) graduates who became leaders in the Durham community. The elder Shepard was already established as an important figure in the Baptist faith, having organized the Baptist State Sunday School Convention of North Carolina in 1872, and served as a representative to the American Baptist Publication Society. Despite his degree in Pharmacy, the younger Shepard elected to pursue ministry as well, and began working nationally and internationally in the establishment of Sunday Schools - traveling throughout Europe and Africa in 1907. Upon his return, James Shepard began work to establish an institution - one that would provide a theological/religious education to the African-American community - dedicated to training more missionaries and Sunday School teachers. He put together the prospectus for a school in 1908, and initially planned to build the campus on 280 acres at Irmo-South, 10 miles from Charleston, SC, on the site of the former South Carolina Industrial Home. He also considered a 20 acre site located near Hillsborough, NC before settling on Durham as the site for the school. Shepard began to travel to raise funds for his endeavor; after raising $1000, he chartered the school as a private institution on June 28, 1909, giving it the lengthy-but-descriptive name of "The National Religious Training School and Chautauqua for the Colored Race." The Merchants' Association of Durham, a forerunner of the Chamber of Commerce, was supportive of Shepard's efforts and persuaded Brodie Duke to donate 20 acres off of Fayetteville Street to the fledgling institution; other accounts say that the Merchants' Association and Duke each donated half. By July of 1909, the curriculum had expanded to include coursework in "agriculture, horticulture, and domestic science," which Jean Anderson postulates were concessions to the various white backers of the school, looking to maintain a blue-collar African-American labor pool. Perhaps - although I'm not sure that people so-motivated would back a college for African-Americans in the first place, as any advanced education hardly helped keep African-Americans in the most menial of positions. Mass meetings to stimulate interest brought prominent speakers: DA Tompkins, Dr. James H. Dillard and Rabbi Abram Simon among them. Julian Carr was treasurer of the organization, Shepard president, and [Dr. Aaron] Moore secretary. Dr. Shepard continued to receieve support from blacks and whites alike. After collecting enough pledges in North Carolina for one building,he made two consecutive tours of the northeast that netted $7,000 more in pledges, sufficient for a second building. An Advisory Board, composed of black and white representatives from ten states and the District of Columbia, met during the summer of 1909 to authorize construction of a frame auditorium and a brick-veneered men's dormitory. Among the Board's officers were N.C. Mutual and Provident Association executives Dr. Aaron M. Moore and John Merrick.. Construction began in November, 1909, and by the time the school opened the following July, three additional frame buildings--a dining hall- classroom building, a women's dormitory and an administration building--alsohad been built.. Two houses, one for President Shepard and one for teachers, were built later in the year. The National Religious Training School and Chautauqua began its first term with approximately ninety students, fifty of them boarders. Ministers were allowed to attend free of charge while all other students paid ten dollars for the six-week summer school course and $3.50 for room and board. A staff of around fifteen taught nineteen subjects: music, religion, normal and primary teaching methods, English, philosphy, ethics, agriculture, domestic science, basketry, dress-making, millinery, and physical education. The institution was actually three schools in one, offering programs on grammar school, high school and college levels. So many of the student's possessed only an elementary foundation that a two-year grammar school had to be set up; it was not discontinued until 1918. The Academy Department was a four-year college preparatory program of scientific, classical and technical courses on a par with high schools of the North, intended to continue where southern high school for African-Americans left off. The College of Arts and Sciences offered four-year programs in classics and sciences and two-year programs in commerce, music, teaching training, domestic arts, and ministerial training. 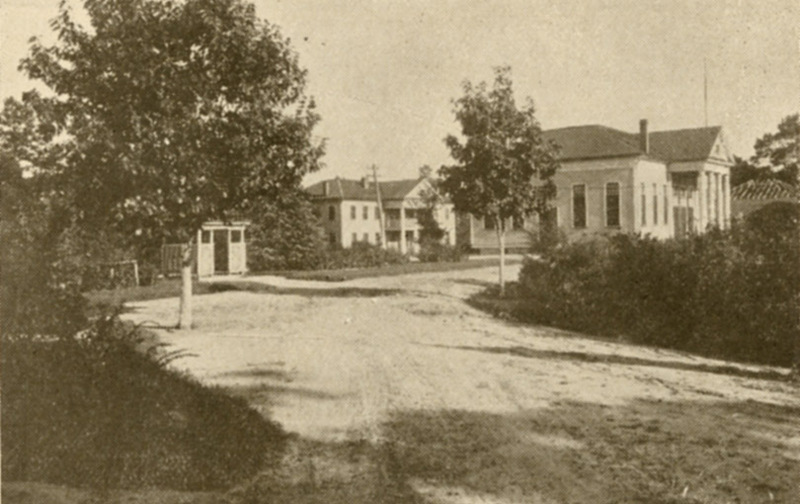 The school opened for business on July 5, 1910. 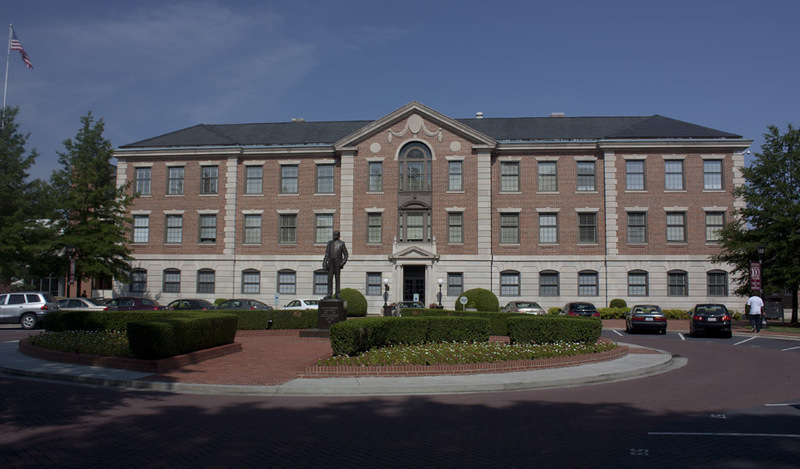 The original campus consisted of mostly Greek Revival frame structures arrayed around a 'bowl' in the center of the campus, including an administration building, auditorium, dining hall, girls' dormitory, and boys' dormitory. The Auditorium, with the Girls' Dormitory in the background, 1922. In 1923, the North Carolina State Legislature appropriated funds for the purchase and operations of the school, and the school was renamed the "Durham State Normal School." 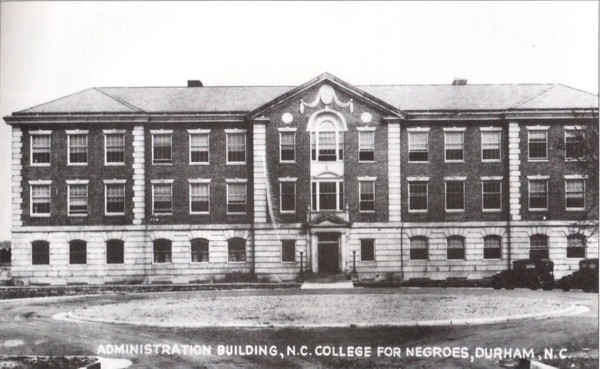 By 1925, it was renamed the "North Carolina College for Negroes" with a focus on liberal arts education and preparation of teachers and principals for secondary schools. 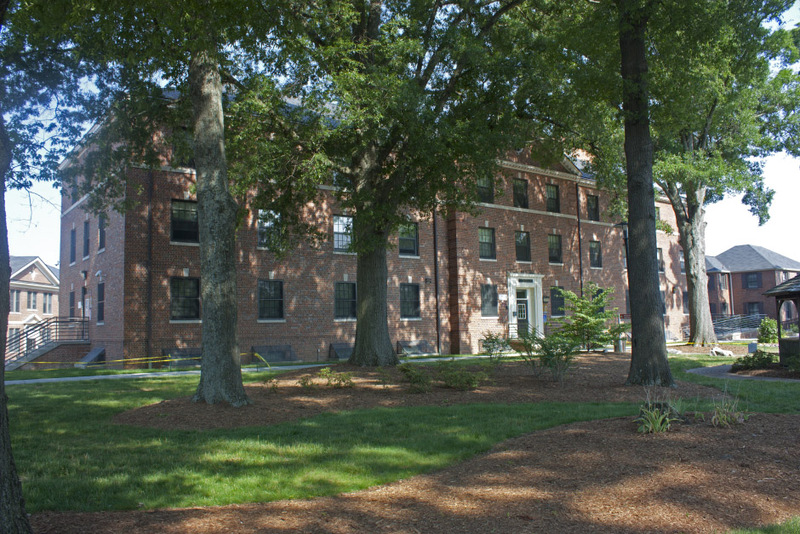 The inclusion into the UNC system provided the funds to significantly upgrade the facilities on campus, authorized by the General Assembly in 1927. 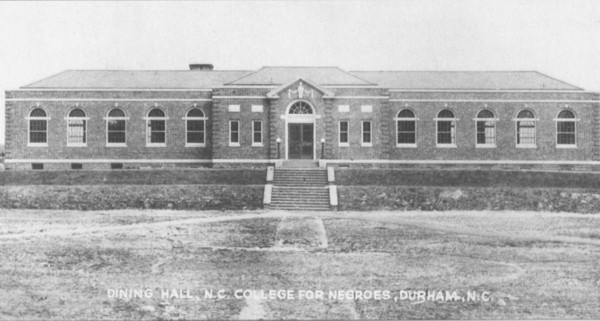 Per NCCU's official history, the support of Governor Angus McClean was an important factor in the appropriation, and the financial support of Benjamin Duke and "contributions of the citizens of Durham" allowed the facilities expansion to move forward. Initially, this was done while retaining some of the original structures on campus; notably the Boys' Dormitory, the Auditorium, and the original Girls' Dormitory were retained, while new masonry structures designed by architects Atwood and Nash, replaced the Administration Building and Dining Hall, and provided a new Gymnasium and Girls' Dormitory. The original Girls' Dormitory became an additional Boys' Dormitory. Campus Map - 1937, showing the remaining older structures towards the southwest corner, and a new cluster of structures arrayed around the new circular drive off of Fayetteville Street. The original Girls' Dormitory, now labeled a Boys' Dormitory, is near the bottom. The building was demolished between 1951 and 1955 as part of ongoing campus expansion. The old auditorium was the longest surviving of the original campus buildings; it was torn down in 1956 for the Biology Building. Part of the original 1910 campus of the National Religious Training School, the Dining Hall was destroyed by fire in January 1925. "Class Room and Dining Hall - Nat'l Training School, Durham, NC"
Part of the original campus of the National Training School, the Dining Hall was destroyed by fire in January 1925. Part of the original campus for the National Religious Training School, the adminstration building was destroyed by fire in January 1925. "Administration Walk - Nat'l Training School" (Teacher's Home on the immediate right and the Administration Building in the background.) - 1910s. The original boys' dormitory building, constructed in 1910, was the only original masonry structure on campus, serving in that capacity until 1937. 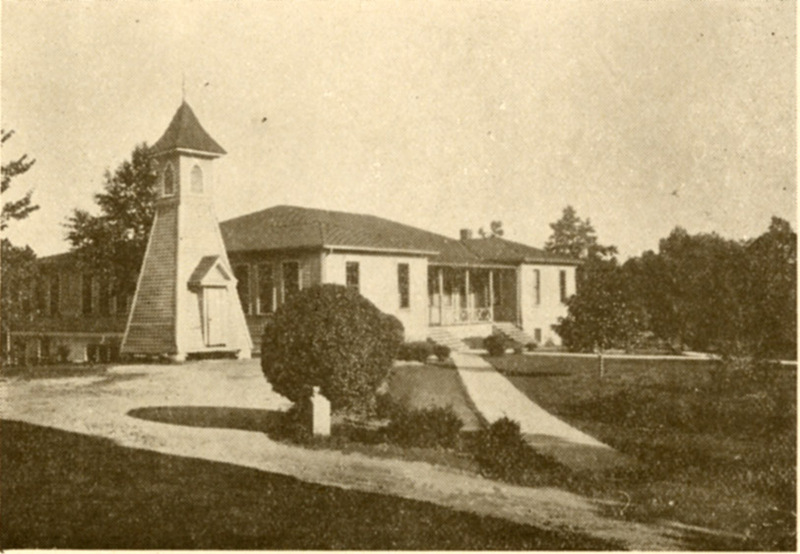 The Boys' Domitory at the National Religious Training School and Chatauqua was built in 1910 as part of the original campus of what would become North Carolina Central University. It was a Greek Revival, brick masonry structure. The original architect is unknown. 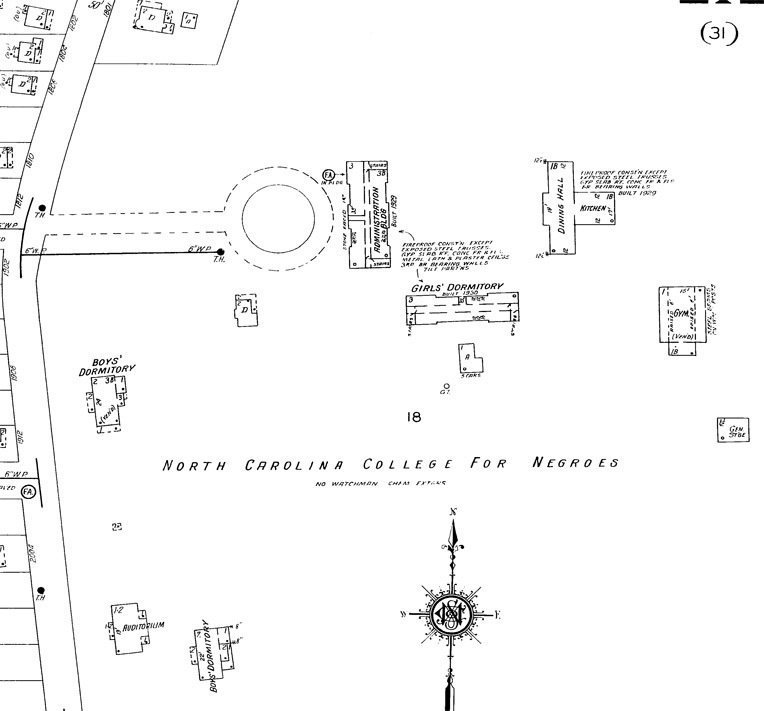 Campus Map - 1937, showing the remaining older structures towards the southwest corner, and a new cluster of structures arrayed around the new circular drive off of Fayetteville Street. The original Boys' Dormitory was demolished in 1937 for the construction of the Science Building. 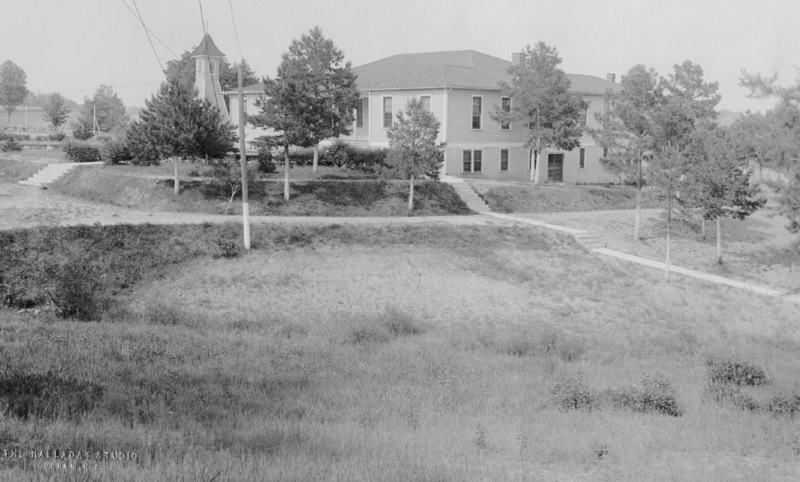 "Campus Scene" 1922; looking east from the front of the campus. The adminstration building is to the left; the Boys' Dormitory is partly visible to the right. The original President's house is partly visible beyond the trees. Shepard struggled to raise funds to support the school. Repeatedly applying to the General Education Board, he faced rejection, as the Board saw his endeavor as a "largely one-man enterprise" and criticized the effort as superfluous, saying "it is difficult to see what place this institution could fill that other institutions do not." Leslie Brown postulates that the GEB's rejection of Shepard's application was due to the intellectual ambition of his program - i.e., the effort to move beyond the manual training model preferred by most whites - contrasting the "Hampton-Tuskeegee Model" of manual training with the preparation of the "Talented Tenth for leadership" as offered by schools such as Fisk and Howard. Shepard had to devote most of his energy to raising money, travelling incessantly throughout the east on fund-raising campaigns that yielded barely enough to meet operating expenses In 1912, the school issued $70,000 worth of bonds, using its property as collateral. The Board of Advisors assisted Shepard, and Benjamin N. Duke both provided substantial aid and solicited funds from business associates and friends in New York, arrong them Mrs. Russell Sage. Nevertheless, without a substantial endowment the school faced repeated financial crises. In 1913, Shepard obtained a mortgage on the school for $25,000 from JS Manning in order to facilitate retirement of the bonds. With the economic strain of World War I, the situation became so desperate in September, 1915, that Manning was forced to foreclose on the mortgage. He sold all of the school property at a courthouse sale to the Golden Belt Realty Co. for $25,100. A few months later, the school resumed operation after Mrs. Russell Sage donated enough money to repurchase the property.. A new Board of Trustees appointed to reorganize the school discontinued the chautauqua features and shifted the emphasis from ministerial to teacher training. Free from debt for the first time, the institution reopened as the National Training School. As the war continued, however, additional gifts were not forthcoming, and Shepard's crisis-ridden struggle resumed as the school increased enrollment and overreached its financial capacity year after year. 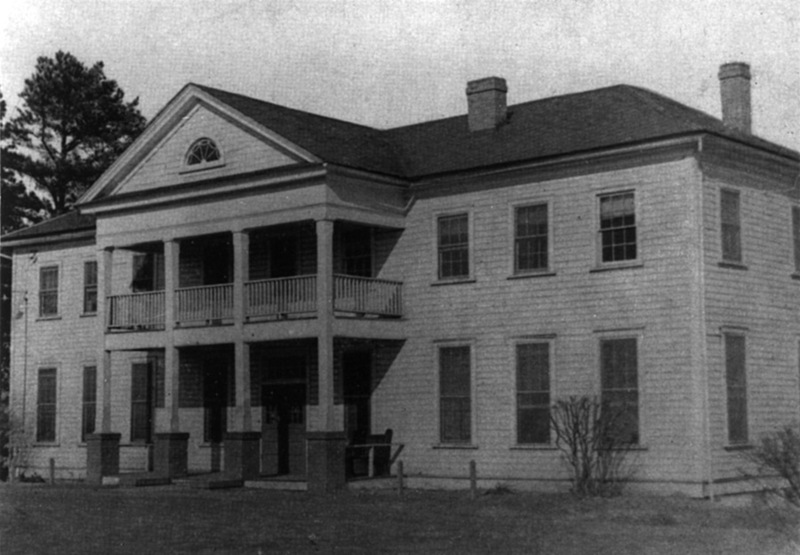 Finally, in 1923, a greater measure of financial stability was acheived when the North Carolina General Assembly appropriated funds for the purchase and operations of the school, which became North Carolina's fifth state normal school for African Americans upon the state's assumption of the school's accumulated debt of $49,000. A new Board of Trustees set up another administration, hired additional faculty, and appointed Dr. Shepard as principal of the Durham State Normal School. It also revised the curriculum, with the intention of cancelling the high school program as soon as the needs of previously enrolled students could be met. A renovation conducted during the summer of 1923 replaced the plumbing and provided fresh paint, but there was not enough money for a building program. No structures had been added to the campus since the fall of 1910, and with enrollment at almost 200 in the fall of 1923, the physical plant was quite lnadequate. 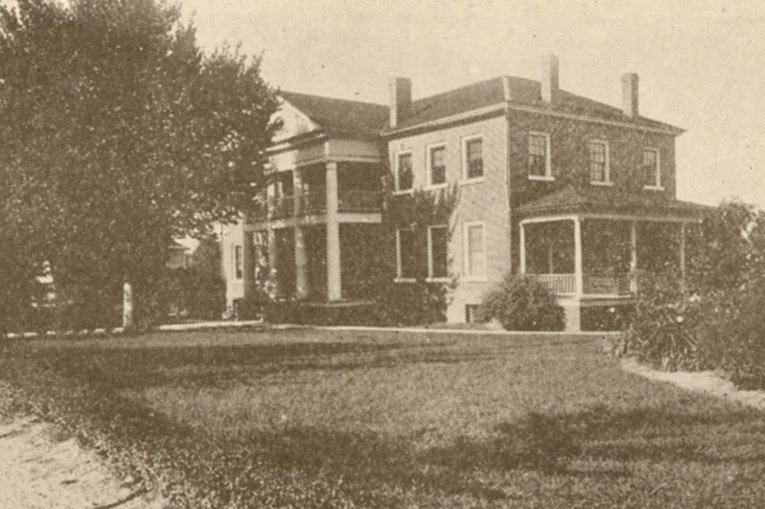 A fund-raising drive was undertaken by the community in 1923 to build a new President's House for Dr. Shepard. A Prairie Style structure was completed across Fayetteville Street from the campus. DR. JAMES SHEPARD HOUSE - 1902 FAYETTEVILLE ST.
Dr. James Shepard, founder of what is now North Carolina Central University, moved to the house at 1902 Fayetteville St. in 1925. The house is Prairie Style architecture - common in the midwest, but not a common architectural form in Durham. 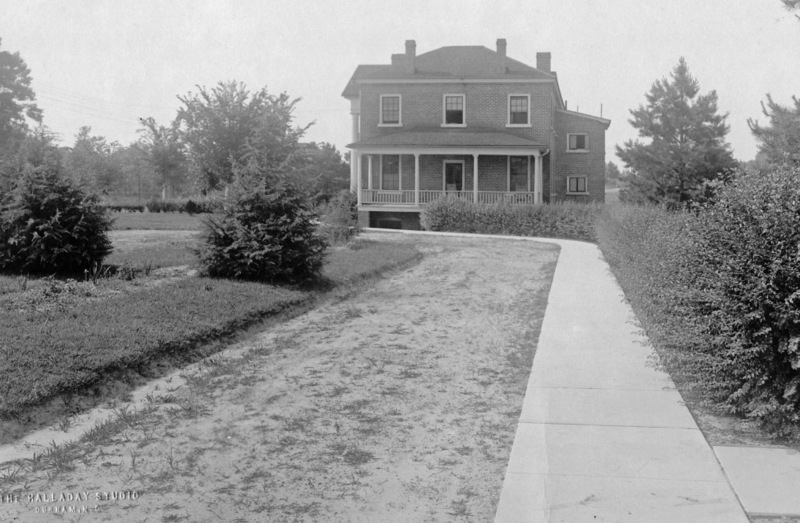 Shepard lived in the house, and served as president of the university, until his death in 1947. 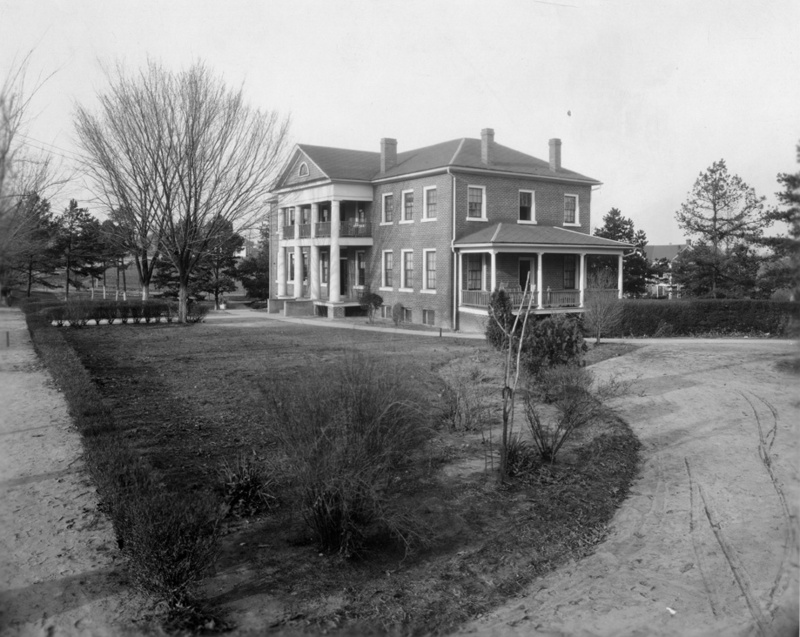 Dr. James Shepard, founder of what is now North Carolina Central University, moved to the house at 1902 Fayetteville St. in 1925. Shepard, son of Augustus Shepard, well-respected minister of White Rock Baptist Church and brother of Dr. Charles Shepard, first lived in a house at 508 Fayetteville St.
After the National Religious Training School and Chautauqua was built, he moved into a small frame house on the campus. A fundraising drive by J.B. Mason, president of the Citizens Bank garnered enough funds to construct a new President's House on the corner of Brant St. and Fayetteville St. by 1923. The house is and was Prairie Style architecture - common in the midwest, but not a common architectural form in Durham. 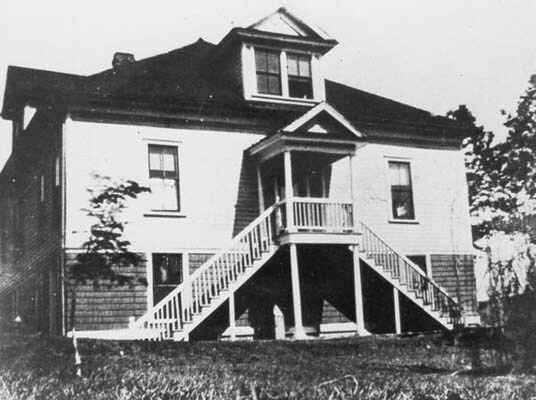 Shepard lived in the house, and served as president of the university, until his death in 1947. The house ceased to be used by the university's presidents (later "chancellors") after a new house for the chancellor was built in 1974. By 1980, it was in use as the admissions office for the university. By the early 2000s, when I first went in the house, the university had abandoned the house, which was in very poor shape. 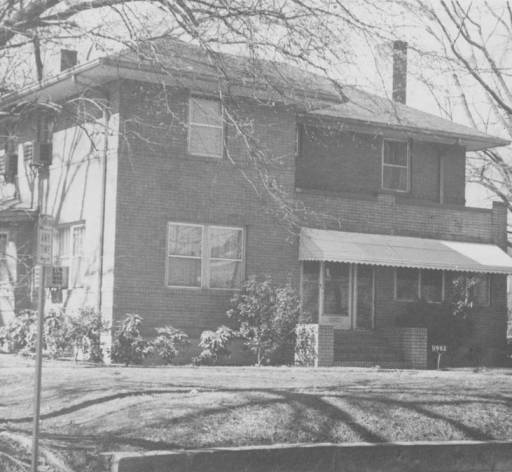 A concerted effort by Carolyn Green Boone, great-granddaughter of Dr. Shepard, resulted in NCCU restoring the house rather than demolishing it; the university received 5,000 from private donations and a grant from the National Park Service to fund the restoration. It is now fully restored, and serves as an exhibit to Dr. Shepard and a meeting space. A general movement to establish a liberal arts college for African-Americans began to gain momentum in the state, and Dr. Shepard began to lobby to have the Durham State Normal School become that college. Proximity to Trinity College, UNC, and Raleigh (as the state capitol,) as well as the strong standing of Durham's African-American community in the state were the foundations of the lobbying effort. During deliberations by the General Assembly, two fires destroyed much of the campus infrastructure on January 28-29, 1925, including the administration building, the dining hall, and "a dormitory" (although no dormitory appears to have gone missing between 1913 and 1937.) Barracks-style buildings were erected to serve the needs of the students. 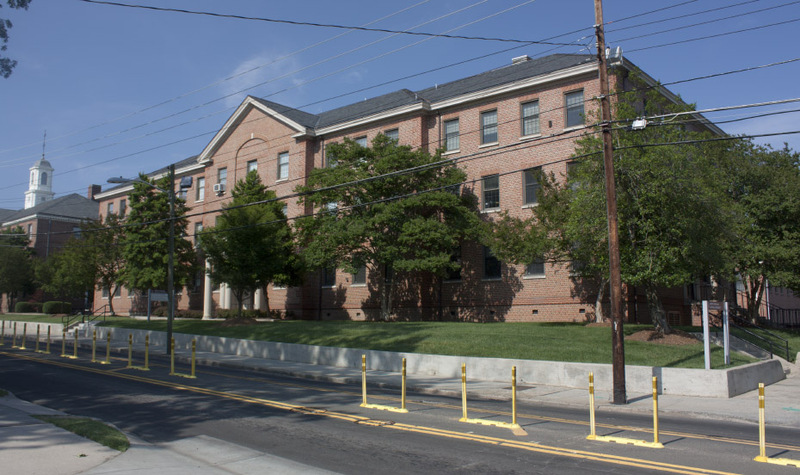 In February, the state selected the Durham State Normal School as the first state-supported four-year liberal arts college for African-Americans. It was renamed the "North Carolina College for Negroes" with a focus on liberal arts education and preparation of teachers and principals for secondary schools. Dr. Shepard was again chosen as chief administrator. 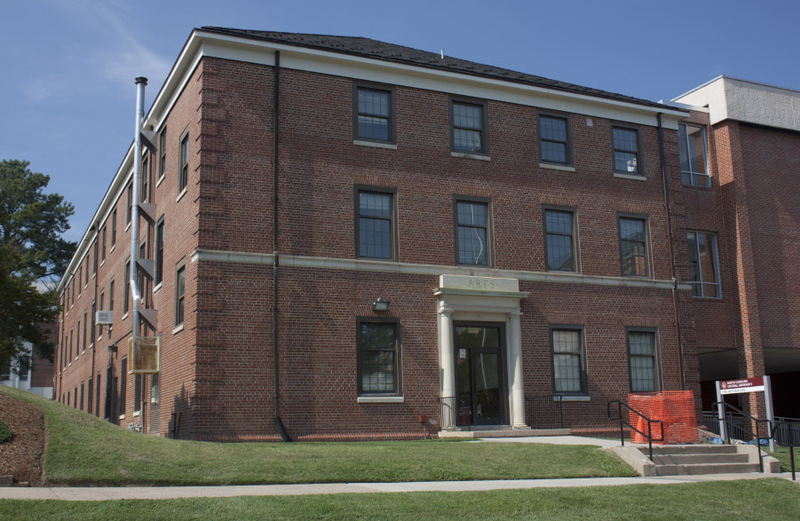 The oldest surviving building on the North Carolina Central University Campus, the Admistration Building (the Clyde R. Hoey Building) was part of the 'rebuilding' of the campus that occurred after inclusion in the UNC system. 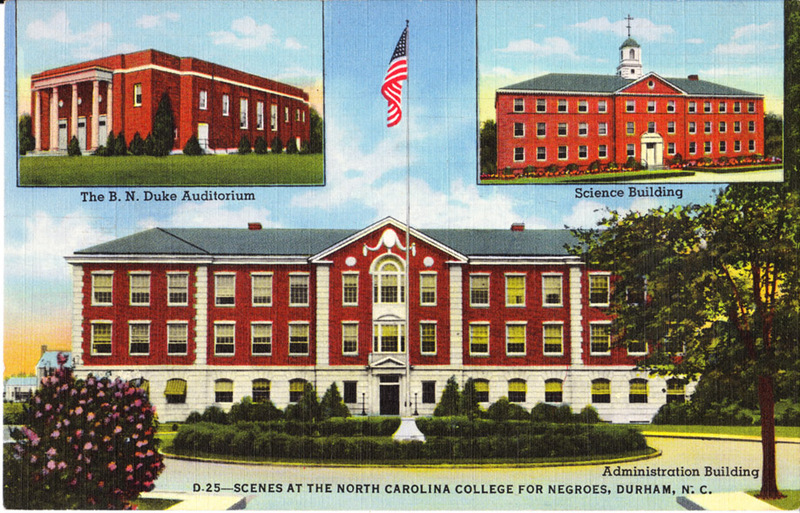 In 1923, the North Carolina State Legislature appropriated funds for the purchase and operations of the National Religious Training School, and the school was renamed the "Durham State Normal School." By 1925, it was renamed the "North Carolina College for Negroes" with a focus on liberal arts education and preparation of teachers and principals for secondary schools. 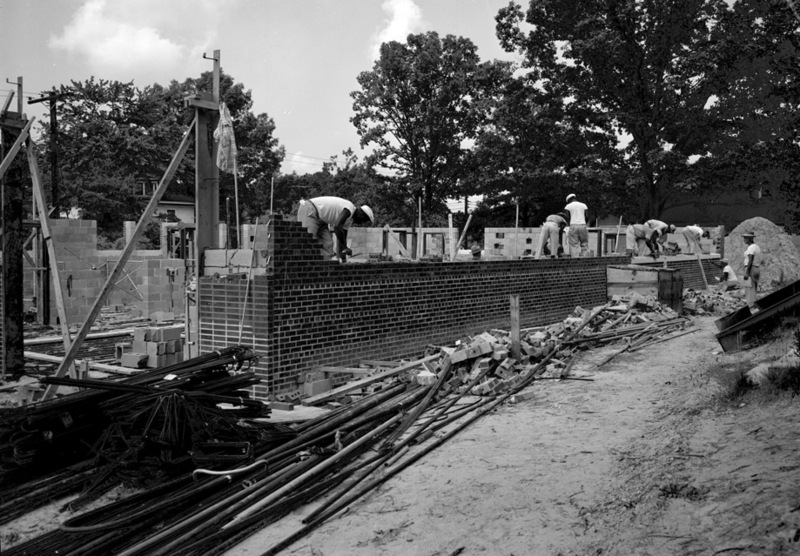 As part of the inclusion of North Carolina College into the UNC system, the General Assembly approved funds for new campus buildings; the original frame dining hall was replaced with a brick building in 1930. This one-story Georgian Revival style building with basement also was designed by Atwood &Nash and completed in 1930 as the dining hall of the new college campus. Originally T-shaped, the building has been enlarged with two more wings to the rear so that it is almost square. Capped by a truncated hipped roof, the Flemish bond elevations feature rectangular windows topped by flat wooden lunettes in round-arched brick lintels. Brick quoins appear at all corners of the building. In the middle of the main elevation, there is a shallow pavillion from which a gable- roofed entrance bay projects slightly. Limestone details include a large medallion with swags above the entrance, rectangililar panels in the central pavillion, keystones above the lunettes, a string course, and a water table. 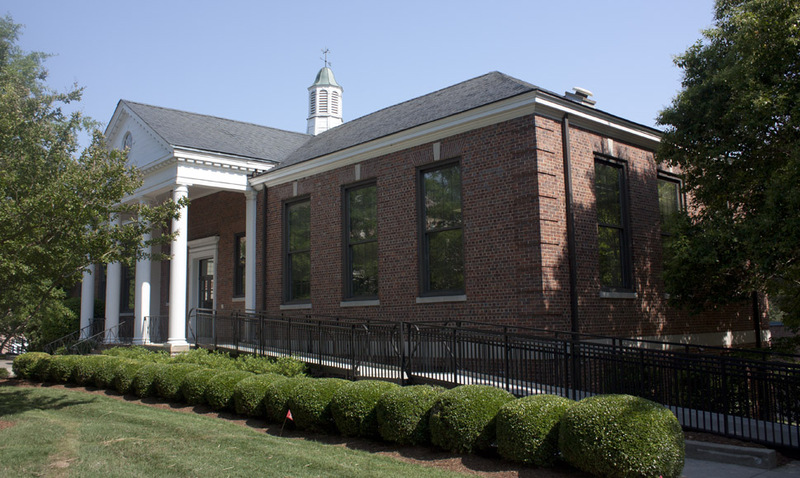 The building has been home to Academic Support Services since at least the mid-1980s. 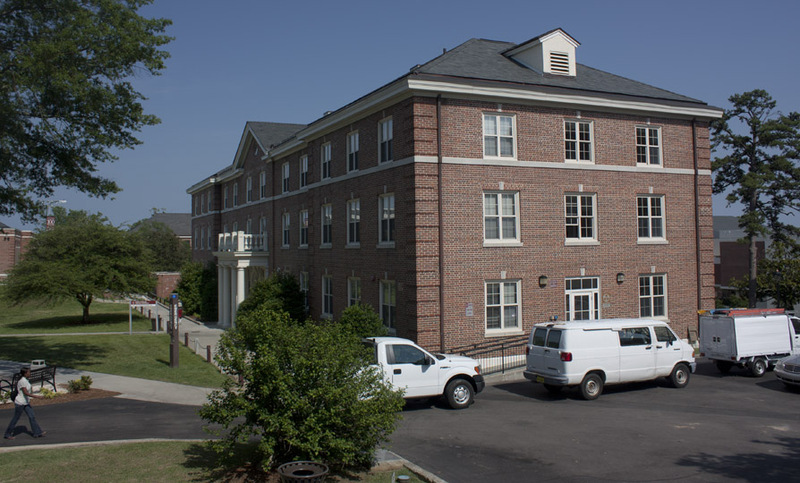 The Annie Day Shepard Residence Hall was the new "Girls' Domitory" in 1930; designed by Atwood and Nash, it is similar to the Clyde R. Hoey Administration Building in its long rectangular three-story hip-roofed form with end pavillions and gabled entrance pavillion. Three-story women's dormitory designed by Atwood and Nash and completed in 1930. Similar to the Clyde R. Hoey Administration Building in its long rectangular three-story hip-roofed form with end pavillions and gabled entrance pavillion. Here, however, the quoins are brick and only the string course at the base of the third story and the keystones in the flat splayed brick lintels are limestone. The shallow one-story frame tetrastyle entrance portico in the Tuscan order is topped by a balustrade with turned balusters, and the doorway with a sunburst fanlight is recessed in a round arch with heavily molded frame surround containing a keystone. A four-story wing identical in style to the original building was attached to the southeast corner in 1950. Annie Day Shepard was the wife of the school's founder and the grand-daughter of noted North Carolina furni- ture maker Thomas Day. She has been cited for her contributions to the progress of the school with her moral support of her husband's work, campaigning for the university, teaching, and even buying and cooking food for the students when the school was struggling in its early years. The physical campus expanded again in the late 1930s with the addition of the BN Duke auditorium - named after the College's largest private benefactor to that date and the Science Building - which was erected at the location of the original Boys' Dormitory. The Science Building and a new library were designed by Public Works Administration architects, and built in a similar style to the Atwood and Nash Buildings. Completed 1937 as part of the Public Works Administration building campaign. The focal point of the flat-roofed building with English bond brick elevations is the two-story frame portico supported by streamlined Corinthian columns that shelters the three identical entrances. 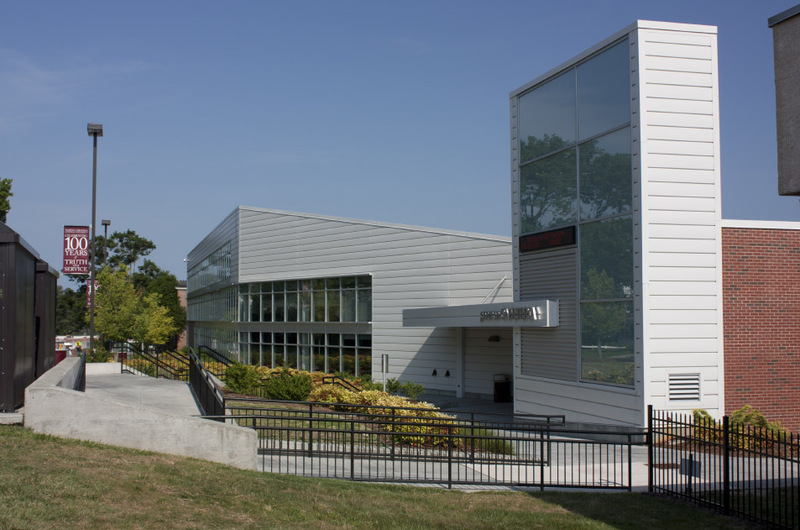 The auditorium seats 900 and is named in honor of one of the school's major benefactors, whose contributions and bequest totalled approximately 5,000. The physical campus expanded again in the late 1930s with the addition of the BN Duke auditorium - named after the College's largest private benefactor to that date. Completed 1937 as part of the Public Works Administration building campaign. The focal point of the flat-roofed building with English bond brick elevations is the two-story frame portico supported by streamlined Corinthian columns that shelters the three identical entrances. Each entrance contains double doors and a transom with muntins in a lattice of pointed arches; a denticulated cornice and curved Georgian entablature tops the drop shoulder surround. A few feet above each entrance there is a stone medallion carved in concentric circles A narrow stone course flush with the brick walls encircles the building at the level of­ the top of the portico. The handsome interior, open the full two stories with a balcony across the rear, features walls divided into panels by applied molding and door surrounds similar to those of the three front entrances. The auditorium seats 900 and is named in honor of one of the school's major benefactors, whose contributions and bequest totalled approximately 5,000. The austere one-story flat-roofed band room built in 1960 is attached to the north side of the auditorium; it has English bond brick exterior walls, skylights, and no windows. Built by the Public Works Adminstration on the site of the original Boys' dormitory in 1939. The physical campus expanded again in the late 1930s with the addition of the BN Duke auditorium - named after the College's largest private benefactor to that date and the Science Building - which was erected at the location of the original Boys' Dormitory. The Science Building was designed by Public Works Administration architects, in a similar style to the Atwood and Nash Buildings. Built in 1939, this three-story brick building with a raised basement was designed by government architect John M. Carmody for the Public Works Administration, which funded its construction. Similar to the other pre-1960 buildings on the campus, it is hip-roofed with a central pavillion and brick quoins. Here the pavillion is pedimented and all cornices are denticulated. Highlights are a tall cupola and a surround with wide fluted pilasters and broken pediment at the main entrance. Recent renovations included lowering the ceilings and installing replacement double-hung sash windows with anodized metal frames. Named in honor of a physics professor who taught at the school from 1937 to 1962. 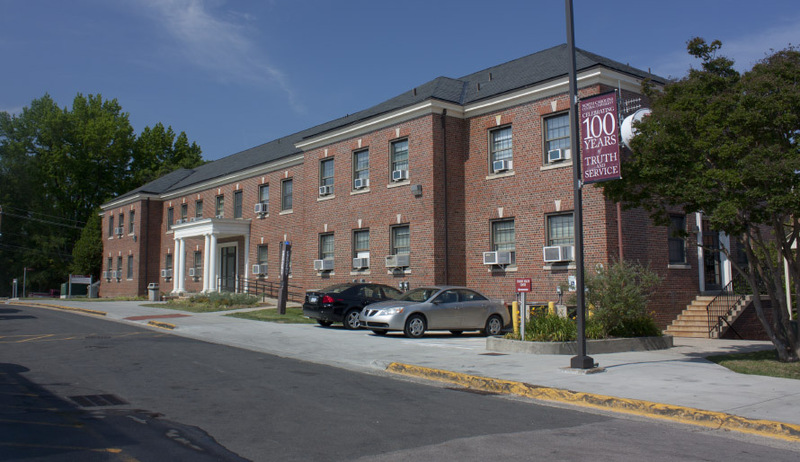 This tall T-shaped and hip-roofed one-story building with a mezzanine and a raised basement is part of the campus building campaign sponsored by the Public Works Administration. Brick elevations in English bond are punctuated by tall windows with. splayed brick lintels and limestone keystones. Constructed as a library, the building later served as the law school and today contains offices. Completed in December, 1937, this tall T-shaped and hip-roofed one-story building with a mezzanine and a raised basement is part of the campus building campaign sponsored by the Public Works Administration. Brick elevations in English bond are punctuated by tall windows with. splayed brick lintels and limestone keystones. Limestone also is used for the water table and brick quoins appear at all corners. Molded box cornices, octagonal cupola with bell-cast roof, and portico all are frame. The temple-style portico in the Tuscan order has a glazed rondel in the center of the pediment. The buildings' interior, the most elegant of the entire campus, has a foyer leading to an oval lobby, both with chair rails and wain- scoting with apnels outlined in applied molding. The lobby also features denticulated crown molding. Constructed as a library, the building later served as the law school and today contains offices. 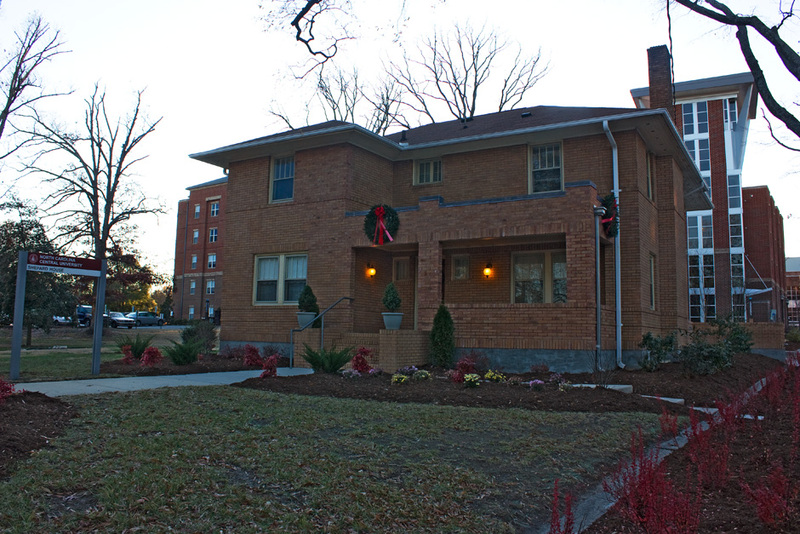 An austere modern two-story wing with a flat roof and brick elevations was added to the southeast corner in 1975. The building was named for a former Dean of the Undergraduate School. 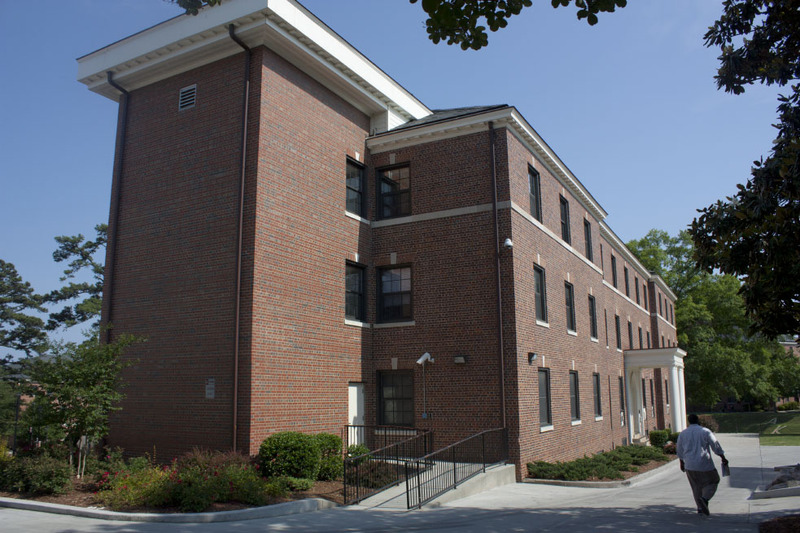 This men's dormitory constructed as part of the Public Works Administration building program in 1937 is identical in form to Shepard Hall except that it lacks the shallow end pavillions. Identifying details include a molded box cornice with modillions; the main entrance is distinguished by a frame surround with fluted pilasters, entablature, and flat denticulated cornice. Named in honor of the North Carolina governor instrumental in arranging state appropriations of 0,000 for new brick buildings. Completed in 1939, the Georgian Revival style building was part of the school's Public Works Administration-sponsored campus building campaign. A slightly modified version of Annie Day Shepard Hall, it lacks a gable above the entrance pavillion and the balustrade on the frame Tuscan portico. Unlike Shepard Hall, however, the fanlight at the main entrance is leaded. 1937 and was admitted to membership in that association in 1957. 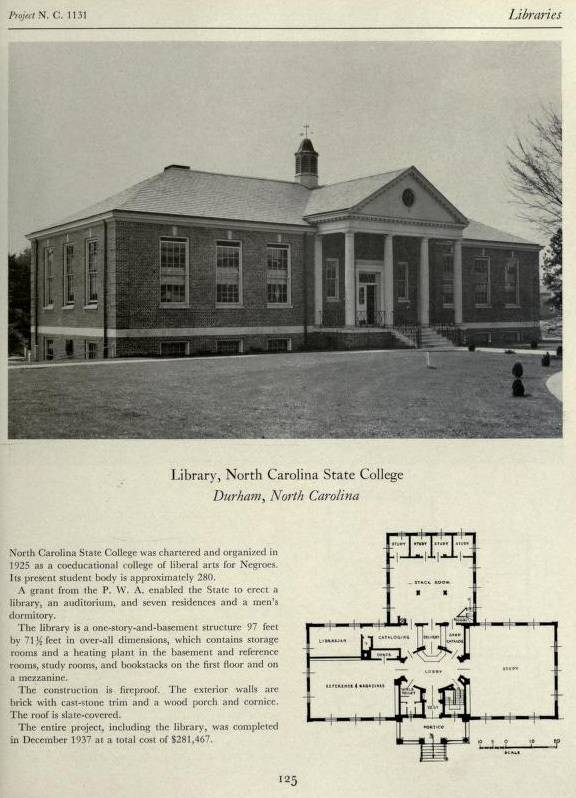 In 1947, the NC state legislature changed the name of the school to "The North Carolina College at Durham." In October of that year, Shepard, who had been the longtime president of the college, died. Between 1937 and the mid-1940s the campus also added new Girls' and Boys' dormitories, an auto repair education building, and a Library. The campus website notes these structures as added in 1937; however, they do not appear on the 1937 Sanborn map. Light Blue: Gymnasium with single story swimming pool (1940) to its right. 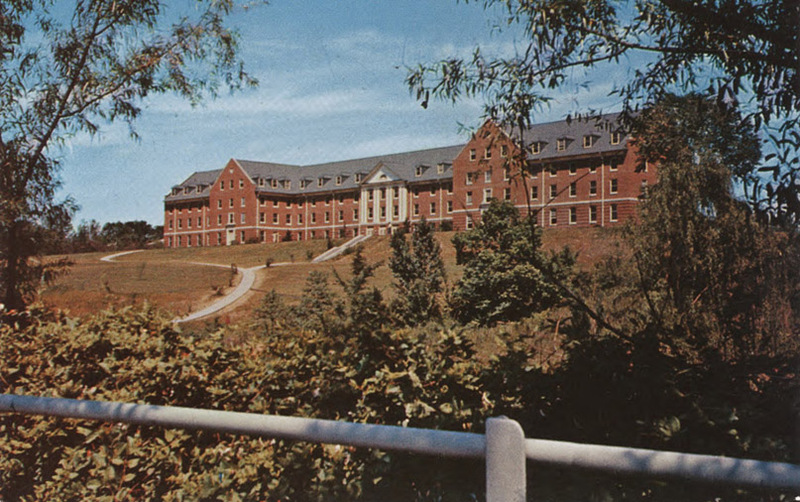 The campus expanded greatly again in 1949-1951, with the addition of a new Library, a new classroom building, a Faculty House, a Music and Fine Arts Building, an Infirmary, a new gymnasium, and the Chidley Residence Hall at the eastern edge of campus. 1950 Sanborn Map of the college, showing the ongoing physical expansion. Built in 1951 as a new men's dormitory - then a ways out from the bulk of the campus - Chidley's view of the football field has been rather compromised of late. Part of the post-WWII campus expansion. Bird's Eye aerial, looking east, 1950s. The last of the original buildings - the auditorium - is still standing in this picture. 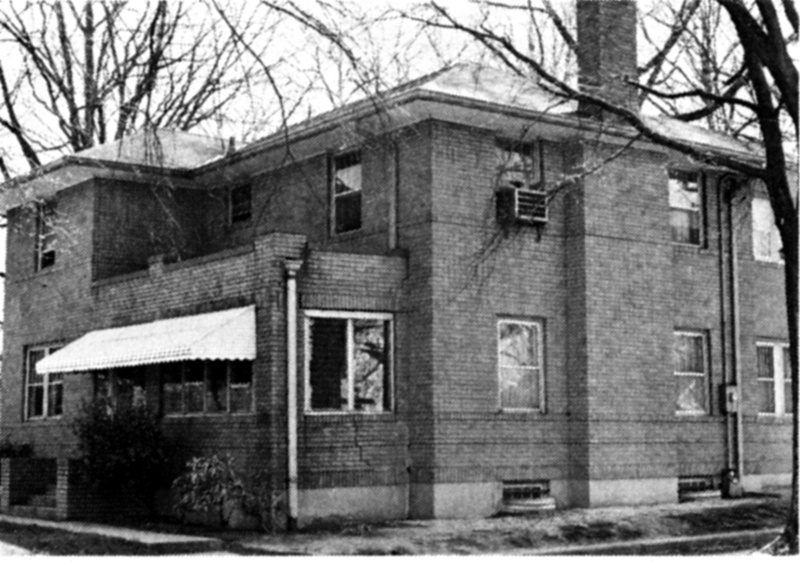 In 1956 it was torn down for the Biology building. Built·in 1956, this Georgian Revival style building is thoroughly compatible with the older campus buildings due to its rectangluar three-story with raised basement, hip-roofed form and English bond brick walls. Cast limestone appears only at the entrances: those at the ends of the building have surrounds with Tuscan half-columns while the main entrance features a convex one-story portico supported by four Tuscan columns. Built·in 1956, this Georgian Revival style building is thoroughly compatible with the older campus buildings due to its rectangluar three-story with raised basement, hip-roofed form and English bond brick walls. Variations include darker brick for the quoins, water table, and string course,above the first-floor windows. Cast limestone appears only at the entrances: those at the ends of the building have surrounds with Tuscan half-columns while the main entrance features a convex one-story portico supported by four Tuscan columns. Postcard aerial, mid 1950s. 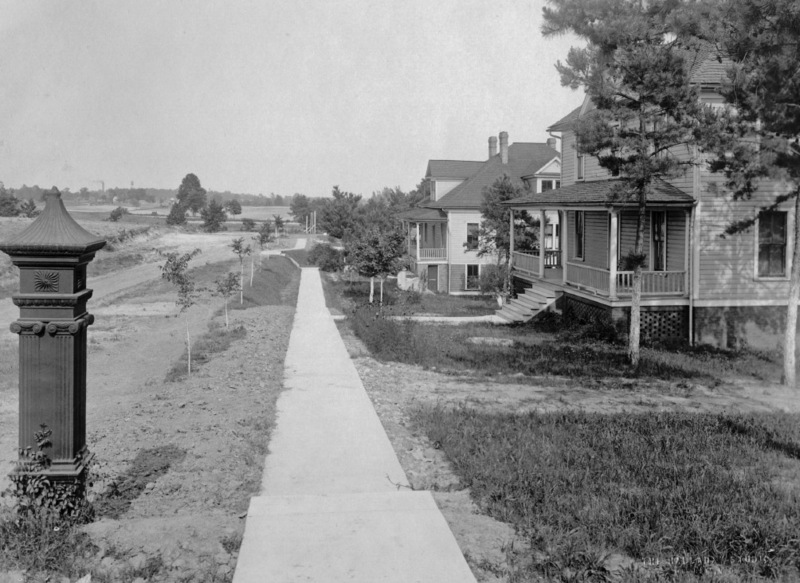 Note the construction of McDougald Terrace in the background, with extension of Lawson Street towards Durham Tech underway. 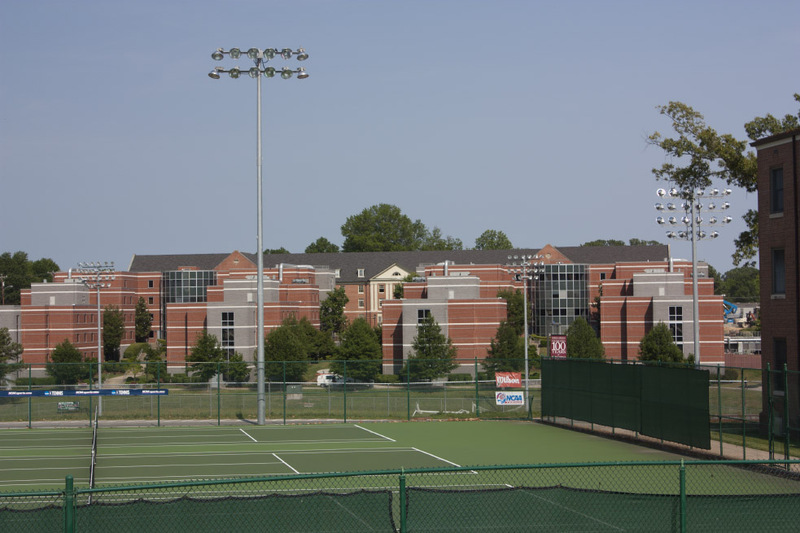 In 1969, the College was renamed North Carolina Central University, and in 1972, became "a constituent institution of the University of North Carolina system. On July 1, 1972, the state’s four-year colleges and universities were joined to become The Consolidated University of North Carolina, with 16 individual campuses, headed by a single president and governed by the University of North Carolina Board of Governors." The university has continued to expand over the second half of the 20th century - moving first beyond its north south boundaries of East Lawson Street and George Street, continuing to expand eastward towards Alston, and more recently, expanding westward across Fayetteville into the College View neighborhood. 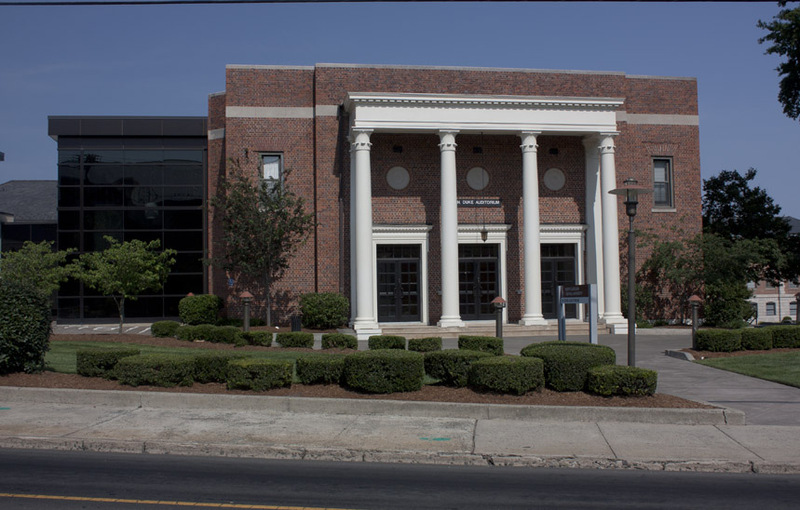 In 2000, the university converted the former Fire Station #4 on Fayetteville St. into a new home for the campus police department. 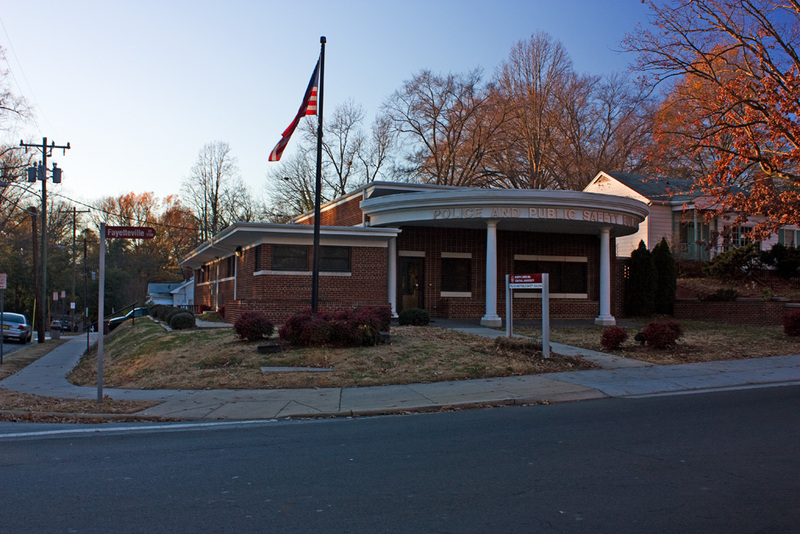 FIRE STATION #4 - FAYETTEVILLE ST.
A new Fire Station #4 was built in 1958, and the station on McMannen St. was closed. This station was built contemporaneously with Fire Station #5 on Chapel Hill Road, and originally the two stations were nearly identical. The station was staffed by an entirely African-American crew - the first African-American firefighters in Durham since the volunteer Excelsior Fire Company of the 1900s. In 1999, this station closed, and the fire company moved to Riddle Road. The building was taken over by North Carolina Central University, which remodeled the building to house their campus police. In the mid-to-late 2000s, North Carolina Central undertook a large-scale campus expansion, crossing Fayetteville Street for the first time to any major extent, and expanding or constructing multiple buildings to the north and east. Several residential blocks of the College View neighborhood, as well as the former Hillside High School, were demolished to support the expansion. An aerial view showing the extent of the campus as of ~2010, and the new buildings west of Fayetteville, which runs left-to-right through the center of the picture. The most architecturally interesting of the buildings constructed during NCCU's late 2000s campus expansion. 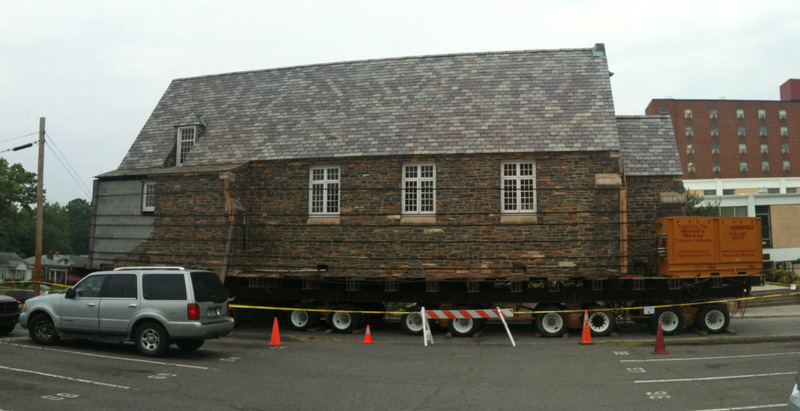 In 2010, NCCU moved the former Holy Cross Catholic Church from South Alston Avenue to a new home on Fayetteville Street, adjacent to the former Dr. Shepard home, where it has been renovated. African-American Catholic Church located on Alston Avenue from the mid-20th century until moved for NCCU's expansion in 2010. 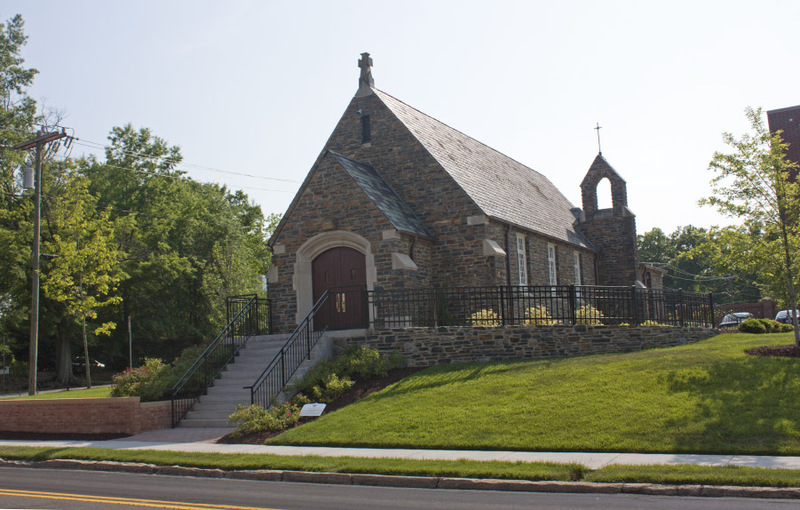 Holy Cross Church was established in Durham in 1939 by the Maryland Province of the Society of Jesus. As such, it was one of North Carolina's earliest African-American Catholic congregations. The congregation built a rectory in 1942, with one room serving as the chapel. The sanctuary was completed in 1953 at 1400 South Alston Avenue. 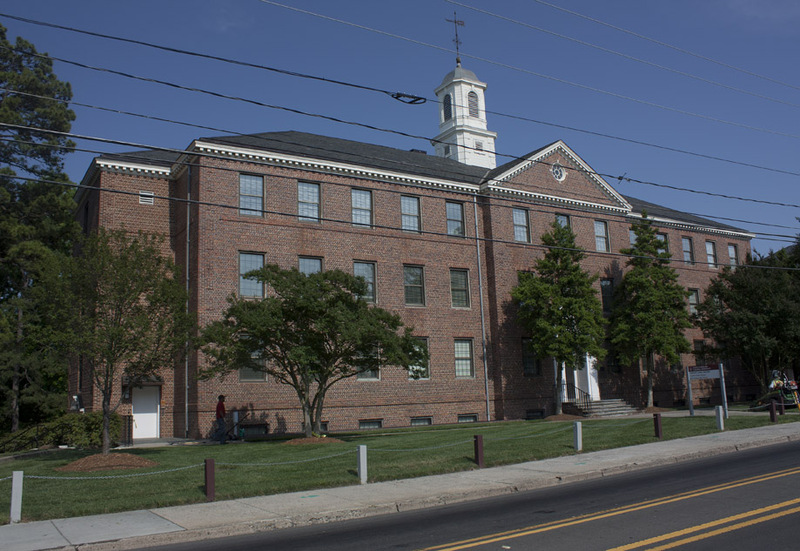 Surrounded by NCCU's expansion for many years, the congregation made the decision to move to _ in 2006, selling the property to NCCU. 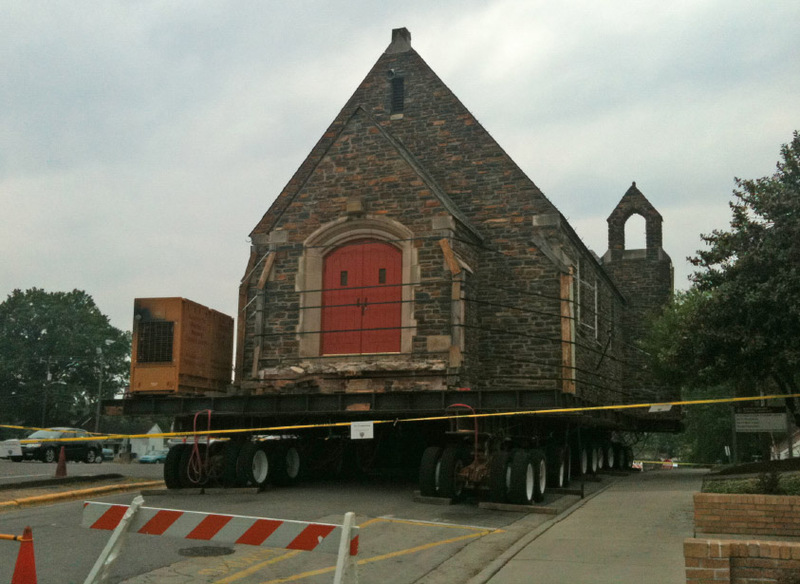 Central moved the church from the original location on South Alston to a new location on the southwest corner of Fayetteville Street and Pekoe Avenue. 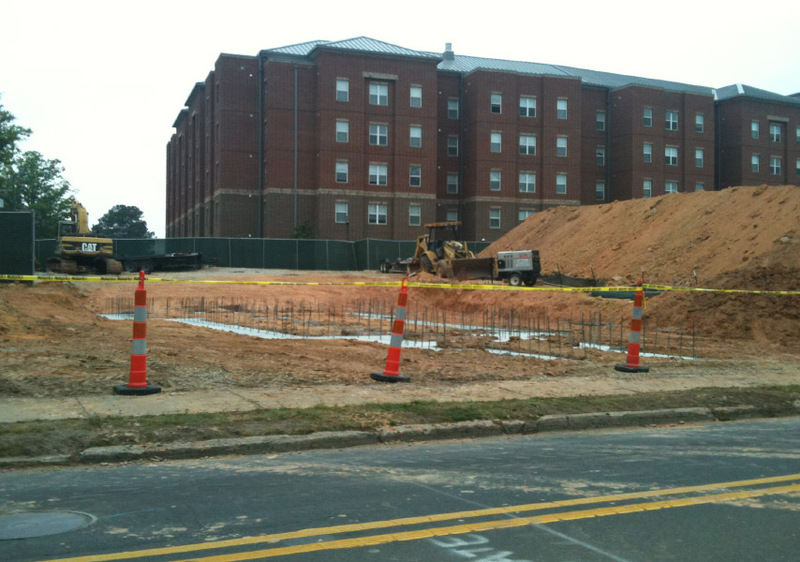 A new School of Nursing is under construction as of 2011 on the original site. 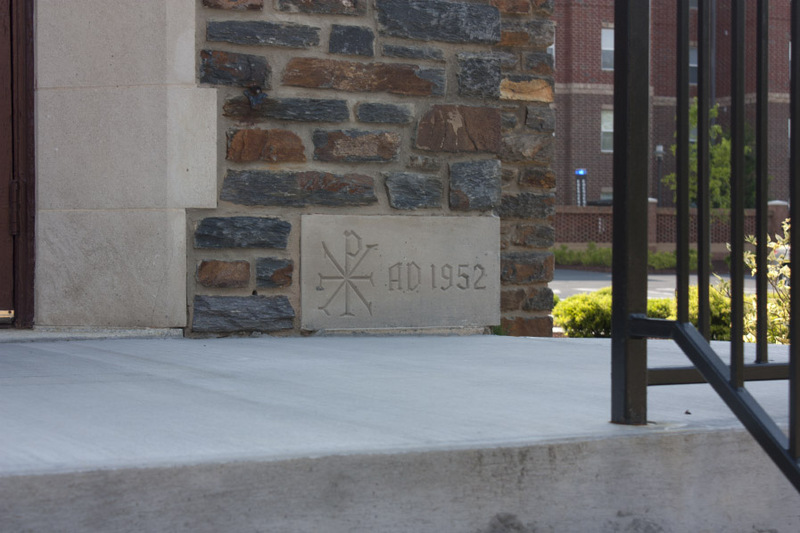 The university renovated the church building and "rededicated and renamed" the building "Centennial Chapel". The Chapel forms part of a park-like area with the <a href="http://endangereddurham.blogspot.com/2008/12/dr-james-shepard-house-1902... renovated James Shepard House</a>.